Are you waiting for the official release of Android 7.0 Nougat for your phone? Android 7.0 Nougat is finally available for the Nexus phones, and other phone users have to wait until the official build of Android 7 is released. Android 7.0 comes with lots of features and improvements; you can check out some of the awesome features of the latest Android 7.0 nougat here. And Nexus users are the first who can get the taste of this new feature on their phones. But don’t worry here in this tutorial we will discuss how to install Android 7.0 on your phone and enjoy all its features. And all credit goes to the developers, who released AOSP build of Nougat. Android 7 unofficial/custom ROMS are now available for most of the Android devices. Which you can use on your phone and get the latest Android. To install these custom ROM on your p[jone all you need a phone with custom TWRP recovery, ROM zip file, and Gapps file. Here in this guide, we are posting some of the Android 7 unofficial/custom ROMS, which you can download from the below mention links. And flash the same on your phone form below mention tutorial. Before following the tutorial do take the backup of your phone. Warning: Technobuzz.net is not responsible for any damage that might happen to your phone during this process. Read all the steps and download the appropriate file your phone, follow the below mention instruction to install Android 7.0 on your phone. You may need the Gapps package with these Custom ROM to install the all Google application on your phone. Download the Gapps file and Flash it after the ROM on your phone. In case if you want to root your phone, then you need to flash the SuperSu zip file. SuperSU 2.82 stable works with the Android 7.0 Nougat AOSP ROM. Download the flash the same after the first boot on your phone. Link to Download SuperSU 2.82 for Android Nougat phones. To get started make sure the bootloader of your phone is locked and you are running on the latest TWRP recovery. See here how to flash the latest TWRP recovery on your phone. 1. Once the ROM, And Gapps Zip file are saved on your phone. Remember the location of your saved files. 2. Boot your phone into recovery to flash the Custom ROM and Gapps zip file. Read here how to boot Android phones into recovery mode. 3. Once into TWRP, take a Nandroid backup. To do so, tap Backup option and select all the partitions including the system, data, boot, recovery, EFS and cache(optional). 4. Go back to home screen of TWRP recovery and tap the Wipe option in TWRP. Tap Advanced Wipe and select partitions like system, boot, data, cache, Dalvik cache. Do not select internal storage. Otherwise, you will delete the Custom ROM and Gapps File, Which you need to flash. 5. After that GO back and tap on the Install option. Navigate to the ROM file from your internal storage and select it. Swipe Right to start the Flashin process. 6. Once installed, go back and select the compatible .Google apps zip file from the location in your internal storage. Flash the same on your phone. 7. Once installation completes, you can wipe the Dalvik cache or just choose reboot to system option. Now your phone will boot, and you will see the new boot logo on your phone screen. It means that the ROM has been installed successfully. Remember first boot will take some time. 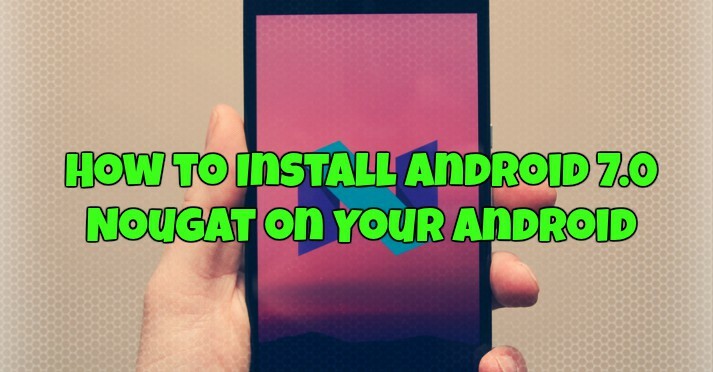 Hope you like this guide to install Android Nougat on your phone. Like and share us on social media. If you need any help, then comment down below. I want to root my intex aqua craze but unable to do so. Plz help me out i want to upgrade .y Android version from lollipop to marshmallow or nougat. I have Nokia 3 which is reset device I can’t log in Google’s account can’t open new setup account. I have 7.1 updated zip file I wanna install it into my phone. How can do it. Without any account.